As a Pacific Northwesterner, pickled watermelon rinds were as foreign to me as fried okra, thus we never saved the rinds for pickling as they do in the South. Into the garbage they went. Who knew turning a typically thrown out piece of food could be transformed into something so delicious. I was well into adulthood when I had my first pickled watermelon rind, and I quickly became hooked. Expecting a salty pickle flavor, I was pleasantly surprised by their soft, sweet and sour flavor. For all you Yankees who have never had pickled watermelon rinds, give them a try. Depending on where you live you can get them in supermarkets or gourmet food stores; you can also purchase them on Amazon.com. If you'd like your own home-made batch, try this recipe. 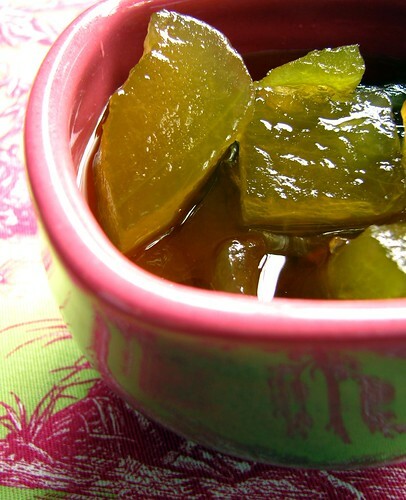 I prefer pickled rinds without any added food coloring, but many recipes call for either green or red. Remove green skin and remaining pink from watermelon rind, then cut into 1-inch chunks to measure 4 quarts. Place rinds in a non-metal bowl and add the water and salt. You may need to add more water in order to completely cover the rinds. Cover and soak overnight in refrigerator. Drain and cover with clear water, then transfer to a large saucepan. Bring to a boil and continue to boil for 30 minutes; drain and set aside. In the same large saucepan, pour vinegar; add sugar. Tie spices in a cheesecloth bag and add to vinegar mixture. Bring the mixture to a boil. Remove from heat and let stand for 15 minutes. Add the drained watermelon rind. Boil gently until rind is transparent and syrup is slightly thickened, about 45 to 55 minutes. Remove spices and spoon into hot sterilized 1-pint jars, leaving about 1/2-inch head space, and seal. Process jars in boiling water bath for 10 minutes. I've never once had pickled rinds either, but have heard of them. Maybe it's something I'm missing out on! Love your story about getting sticky as a kid, those are my memories as well. Then to relive it, I cut up a melon this year, gave us all a large wedge, and we all headed outside. Great stuff. Ooh, when I was growing in Russia, my grandparents and parents pickled watermelon: entire slices of them. That as soooooooooooo good! They also did similar things to apples. I love it when it's wrapped in bacon and baked. It tastes like candy! I have an old recipe too, from my grandma! It uses oil of clove and oil of cinnamon so the rid comes out like stained glass and the brine has no cloudiness! YUM! I need to go buy a melon.. and hope for one with a good thick rind! My curiosity is piqued. I should try this real soon before watermelon season is over. Wow! I just tasted this - it's great. I can't imagine at 68 years old I have never tried this. Sheri-I'm clearing out my e-mails and ran across a note from your proud dad some months ago inviting us to view your blog. I'm blown away! Your site is beautiful, informative and inspiring. I'm hooked! Just had pickeled watermelon rind wrapped in bacon this past labor day weekend and yeah , I'm hooked. Everyone out there wrinkling your nose at this, I did the same thing ....until I tried one. Now i have all the ingredients do make a batch today for the start of NFL Football. I have a friend who's parents live in Alaska.Her mom sent us some every year. I have been wanting them for a while. SoI'm glad to see a recipe for it, thank you so much. they are really delicious.